If you’re looking for new summer or winter tires, you can trust Groupe Spinelli’s dealerships in the Montreal region. We offer several choices of tires of all types and sizes at the best prices on the market. 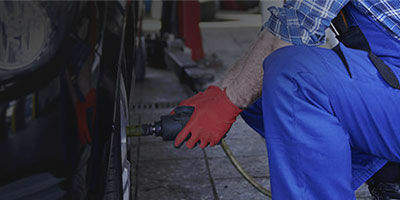 To learn more about our installation service, tire storage, as well as our special offers and discounts on the purchase of new tires in Montreal, contact Groupe Spinelli today or book your appointment using our online contact form! When purchasing your tires from your Spinelli dealership, you benefit from the Road Hazard Protection Plan. This protection includes repair or replacement of your tire in the event of damage (cuts, dents, damage by impact or perforation) due to road hazards. This guarantee is valid for a period of 3 years or 50,000 km with a proof of purchase; certain conditions apply. Make an appointment by phone or on the Internet. You’ll be given an appointment in the next 48 hours, guaranteed. For customers who have an appointment for a tire installation only, the installation has to be done within an hour. Installation time may vary depending on vehicle model. This policy does not apply on a vehicle with run-flat tires and on large-size vehicles (SUVs).